PARIS, France, December 1, 2015 (ENS) – France will invest a total of €2 billion (US$2.1 billion) in renewable energy in Africa in 2016-20, a 50 percent increase in comparison with the past five years. 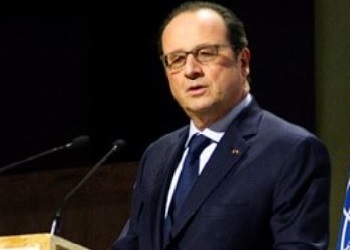 French President François Hollande made the announcement today alongside UN Secretary-General Ban Ki-moon at the Climate Challenge, African Solutions summit at the COP 21 climate change conference in Paris. Programs will encourage the use of solar energy, wind power, hydroelectricity or geothermal energy, depending on the potential of each country. Projects financed by France will be able to register as part of the initiative on renewable energy led by the African Union. The summit gathered 12 African heads of state, the President of the Commission of the African Union and representatives of several governments as well as international institutions such as the World Bank and the African Development Bank. 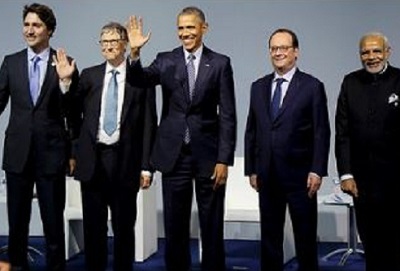 At another event, held on Monday, some two dozen high-tech leaders launched the Breakthrough Energy Coalition, which aims to revolutionize the generation of clean energy, giving a boost to civil society’s climate solutions. Among the billionaire founders are Microsoft’s Bill Gates, Facebook’s Mark Zuckerberg, Amazon.com’s Jeff Bezos, Alibaba Group’s Jack Ma, Virgin’s Richard Branson and George Soros of the Soros Fund. Gates alone will contribute US$2 billion to the new coalition. The investors will work with 20 countries who have formed Mission Innovation to explore new clean energy technologies. Each of the 20 nations has promised to double its clean energy R&D budget over the next five years. “Scientists, engineers, and entrepreneurs can invent and scale the innovative technologies that will limit the impact of climate change while providing affordable and reliable energy to everyone,” they said. In a separate effort announced on Monday, 11 donor nations pledged close to US$250 million in new money for adaptation support to the most vulnerable countries on the planet. Canada, Denmark, Finland, France, Germany, Ireland, Italy, Sweden, Switzerland, United Kingdom, and the United States announced their contributions to the Least Developed Countries Fund, a climate fund hosted by the Global Environment Facility, GEF. “We know that many billions are required over the next few years to fill the gap in climate finance, but the money pledged today is vital to help some of the most vulnerable people on the planet cope with the immediate impacts of our rapidly warming world,” Ishii said. Droughts, violent storms, sea-level rise and other climate changes are already impacting the poorest and most vulnerable countries and communities. “This funding for adaptation is urgently needed to help sustain the hard-earned momentum for action on the ground that some of the most vulnerable countries have achieved in recent years,” said Ishii. Germany is the top contributor with a total amount of 50 million Euros (US$$53 million). The United States came second with a contribution of $51 million, while the UK came third with a contribution of 30 million GBP (US$45.1 million) to the LDCF in 2016. The new financing will enable the GEF to respond to the many existing requests for support ranging from investments in new approaches to agriculture to national adaptation planning and building resilience against climate change variability and disasters. In a separate set of pledges Monday, four European countries – Germany, Norway, Sweden, and Switzerland – announced a new $500 million initiative – Transformative Carbon Asset Facility – that will find new ways to create incentives aimed at large scale cuts in greenhouse gas emissions in developing countries. The Transformative Carbon Asset Facility will help developing countries implement their plans to cut emissions by working with them to create new classes of carbon assets associated with reduced greenhouse gas emission reductions. The facility will measure and pay for emission cuts in large scale programs in areas like renewable energy, transport, energy efficiency, solid waste management, and low carbon cities. It could make payments for emission reductions to countries that remove fossil fuel subsidies or simplifying regulations for renewable energy. This Transformative Carbon Asset Facility will start operations in 2016 with an initial expected commitment of more than $250 million from contributing countries. The facility will remain open for more contributions until a target of $500 million is reached. Last month the multi-lateral development banks promised to jointly contribute US$100 billion a year by 2020 to help developing countries that are most vulnerable to climate change cope with the crisis.